Watson's MyPaws All-terrain Dog Shoes are innovative dog booties especially for active and aging pets. Designed to protect your dog paws and provide superior traction and stability. Neoprene uppers and non-marking rubber soles make them perfect for any weather and all-day adventures in any environment. Provides improved footing for disabled dogs on slick floors. MyPaws dog boots are good for winter conditions as well. Solid rubber sole protects dog's paws from sharp objects and from the heat and cold. Non-marking, rubber sole provides superior traction on smooth slippery surfaces. Protects delicate floors from scratches and from nail marks. Ideal for older and active pets that require superior traction and stability. Lightweight, breathable, porous design keeps dog's paws cool. Easy to put on and to take off. Two velcro straps wrap firmly around leg to keep shoe firmly in place. Two points of adjustability allow for a comfortable, customized, snug fit. Upper is made of lightweight, water repellant, quick-drying Neoprene making it perfect for water and all-day adventures. Rugged, Ballistic Nylon toe-plate resists damage caused by a dog's nails. 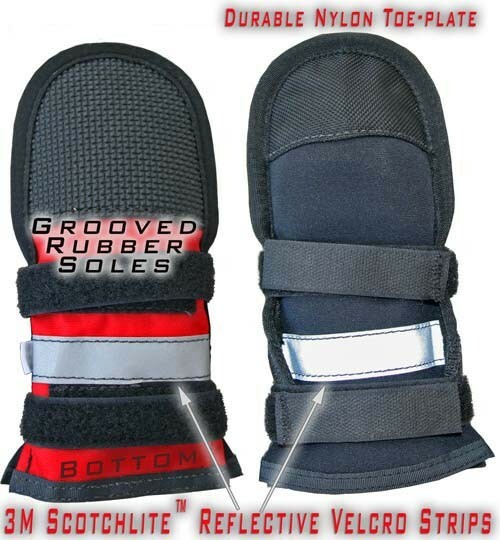 Toe-plate also provides additional durability and protection if dog drags a paw due to injury or disability. 3M Scotchlight reflective velcro straps provide superior safety and visibility at night. Will not retain odors. Sold as a set of four. The boot itself is good but the straps for attaching it are terrible. The \"hook\" end of the velcro fastener is attached to the end of the fastening strap instead of to the boot itself. The straps flail around as the boot is being put on the foot, they attach to each other so you are not only struggling to get the boot on but also untangle the straps. Also there is no good reason for the straps to wind around the boot in opposite directions. This just add to the confusion.